I got home Saturday after a mostly leisurely journey northward through the Shenandoah Valley along Routes 42 and 11 before hitting the highways of US340 and I70. Turns out that 2 of my photo blogs emailed from camp went awry due to typos, and the smart-phone [sic] doesn't show rejects. So here are the missing tales. 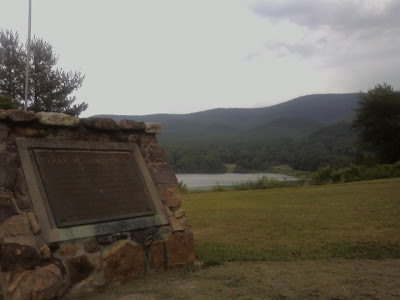 The photo shows the plaque dedicated to Meriwhether, the huge lake that Goshen Scout camps surround. I'll transcribe the text later if possible. My trip here was pretty easy, heading around the Baltimore Beltway, west on I70, then 340 through Virginia, passing Harpers Ferry to West Virginia, near Winchester, and finally traveling about 100 miles south through the Shenandoah Valley to Staunton. In Staunton I took a tour of the Woodrow Wilson birthplace and library, learning of his family, politics and history. His eldest daughter moved to India-need to research this trip. After checking in at Goshen, I was given a temporary tent assignment. With about 50 others, we were trained in Conservation USA for about 3 hours. After a decent camp dinner, some down time for camp chats then another meeting at 8pm. Still not sure which of 2 work sites I am going to-hope to know at breakfast Saturday. About 400 other campers will arrive today and I'll switch from student mode to squad leader. Yesterday we had too many fire rakes but today we needed more on the gentler grades. The morning went by quickly and we leapfrogged 2-3 person parts of our squads as we moved up the trail. 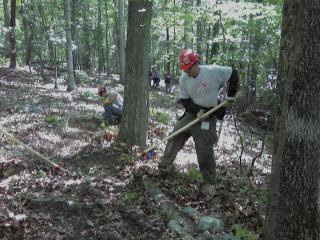 The photo shows me using the fire rake to mark the trail. After lunch we slowed down forward progress as we reached a section with not much more of a grade but many more rocks underfoot. Creating the best path became a continual mental effort to avoid large boulders we preferred not to move. Near the end of our work day we were tackling a low spot that needed reinforcement so we need to pass that onto the next crew. Day off for recreation tomorrow! Our trip home was detoured as we were somehow picked to be driven to a press sit where we listened to speeches by local dignitaries and then were served local watermelon. A nice honor; I met the Order of the Arrow National Chief (and got his autograph), but we were tired, dirty and hungry, so standing in the sun was not the plan I had in mind. Eventually we returned to Goshen for dinner and cleanup. Today we were down 2 squad members, 1 from an injury sustained during mountain biking Wednesday and another from probable dehydration by 10:30 AM. But we continued working on trail building, and were joined before lunch by the National OA Chair Bradley Haddock and 2 associates (Carey Miller and Jack Butler). I have photos showing them at work that I will transfer later. They went back down the trail after having lunch and program with us. Our crew leader Jake Knudsen (who had his 19th birthday yesterday) spoke about "Why me, Why now?" After lunch our progress slowed due to the necessity of taking frequent rest and water breaks. But we persevered and left the trail better than we found it. A rocky spot we found Tuesday needed a bit more attention to get rid of obstacles. 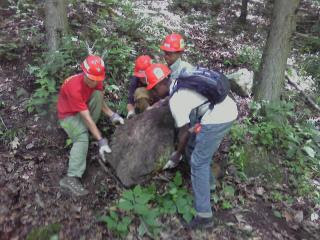 We were joined by Geoff Landau, the Youth Incident commander, who helped move rock and locate the best trail. Battery is low, so stopping here. It's Wednesday, my first day off at ArrowCorps5. Last night I typed up a story about the 2nd trail work day, and the smart phone said message rejected. So, rather than repeat the story I'm doing the same picture with new words. Easier work in the morning Tuesday, but rocky spots Wednesday. Lots of dignitaries not just on the trail but in a shady spot off trail. The squad is doing great work, making tremendous progress and learning a lot of new skills. I'm learning to let them be leaders and make decisions for themselves. They range from 13 to 18, so it's like I'm their Scout Patrol Leader. Food has been awesome, lots of pork, grits, watermelon and other local cuisine. 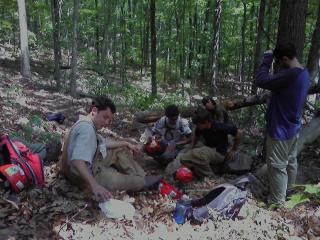 Trail lunches are *not* Philmont food :-). Today we spent a couple hours on a fire fighter bus commuting to and from our assigned site in the National Forest. 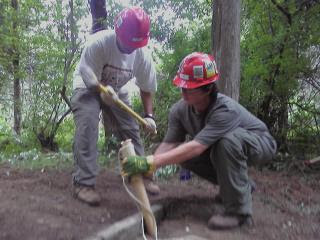 The 8 squad members on my team and 7 from the other squad in my crew worked at a trailhead grading and widening the tread, and getting rock walls set up on the downhill side. The photo shows half my squad migrating a double hernia sized rock down the slope (always easier than going up). I have a 10 second video clip of our crew leader moving a rock but cannot get it online until later. Crackerbarrel just started so it's time to get back in line for more food! Today I and fellow squad leaders completed Conservation USA training with 4 hours of field work. We started with project planning, tool talk and risk assessment. The photo shows Raj and Mike (?) pounding a stake behind a water bar to keep it place controlling erosion. We worked on a few spots on a trial in Camp Olmsted, where my troop was 2 years ago. After my training was done, I hiked over to Camp Post, found my squad of 8 youth from Tipisa Lodge as well as my crew leader Jake. Breakfast is 6:15 tomorrow, followed by an hour or so drive to James River area for trail work. Can't wait! 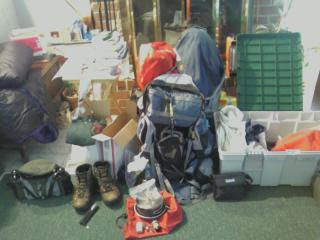 I have been getting ready for this trip for more than 6 months, having heard about a national service project in 2007, getting my OA lodge to sign off on my application at training in December. For a while I thought I missed the opportunity but I was given a staff position. Tomorrow I'll drive 250 miles or so, ending up at Goshen Scout Reservation, where our troop was 2 years ago and where our CIO was a Boy Scout (a few years earlier). The picture isn't as nice as the covers of the Complete Walker that I've daydreamed over for years, but it's a reasonable facsimile. I had my car serviced to help avoid an untimely breakdown but the mechanic was not able to fix an intermittent light. He did find the short is under the dash, and gave me the helpful workaround of hitting the dash. I think that's how this trip is going to go. I hiked Sunday morning from around 6AM to around 10AM, covering the north and south sides of Eastern Avenue in a figure-eight pattern centered at the Essex library branch. This was a decidedly urban hike, maybe not center-city, but retail, service and medium density housing. Almost immediately I spotted a battery, and continued walking, picking up dead batteries, taking pictures of landmarks, batteries and other minutia. 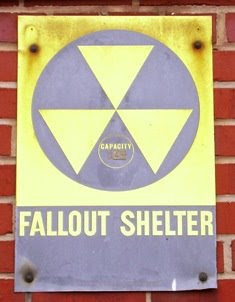 A fallout shelter sign at the back of the Eastern Avenue job placement center. The capacity says 146 people. Wikipedia says Essex, Maryland had a population of 39,078 at the 2000 census. A partial spork near Eyring Avenue. 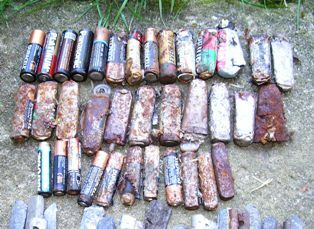 This was the largest amount of batteries I've collected yet on a hike, with sometimes 2, 3, 4 or more being visible on street gutters within feet of each other. 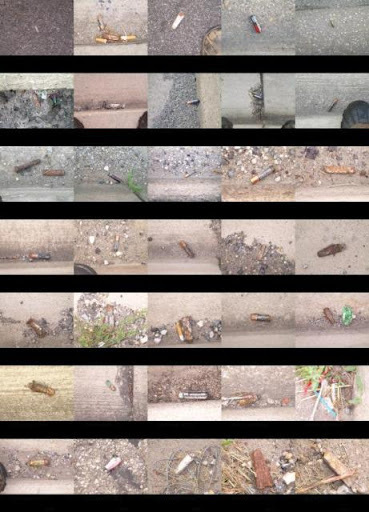 I'm reading about Warren Zevon's life, and the obsessive-compulsive behaviors he exhibited, and those of his neighbor and friend Billy Bob Thornton, and thinking, am I getting all obsessive about collecting dead batteries, counting them, showing pictures of where and how they were found? I took pictures of 35 individual batteries, some more than 1 shot, and I took a few pictures of lead weights. I'll put them on EditGrid.com once I edit them into a semblance of order. Obsessed? Compulsed? You tell me. 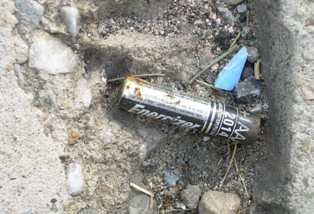 The high concentration of batteries found seem to be on busy streets with very little grade, and no recent resurfacing. Spotting them is getting easier - just look for a pile up of gravel with a battery wedged uphill. Or in a low spot in the road, where normal rainfall doesn't wash them downstream into the tributaries of the Chesapeake Bay. This is not my normal blog, not that there is any such beast; I'm using this platform to define a few metrics for customer experience on the www.asug.com web site, a place for SAP users and related community members to network. We periodically set goals to "improve the web site" and use various ways to measure what this means. There's an absolute measure of how many accounts have been created. While I see a number over 80,000, that's not the number of people that we advertise as current ASUG membership, since when someone abandons an account we would not reuse their ID number. We should know the number of new accounts created by day, week or month. People sign up under a company or other entity, so we should know the growth in number of companies. We should also be able to see the number of members in categories such as 1-10, 10-100, 100-1000, 1000+. This would enable us to see the trends as smaller companies bring up SAP applications and join ASUG. In order to gauge changes in member activity we need to see the number of people who log on to the ASUG.COM site each day, week and month. This should include both the total number of logins, the distinct user logins and the distinct company logins. Because purging of membership data may happen infrequently, we need to know when and how member rolls are adjusted. Deletions for invalid email address, company no longer a member, and other reasons should be shown so that growth patterns are correct. Members are subscribed to services in multiple ways, such as SIG and Chapter identification, and opt-in for discussion forums and ASUG member network. Each of these needed to be reports. We want to encourage the use of our discussion forums, and to document that this is successful we need to see user activity by various methods. The number of site logins is listed above; other metrics would be the number of new threads created, the number of thread replies, the number of distinct users asking questions, and the number of distinct users answering questions. Company reports to champions showing activity (or lack of) by user in that company. Metrics: SIG membership: since many people belong to multiple SIGs, aggregated membership totals are higher than the true number, so the methodology should be made clear. It's finally to the point where I feel like the 12 Monkeys universe intruded into our own. I was connected to a webcast today and the speaker mentioned something about a soccer game starting in 45 minutes. After I mentioned this in a random thought tweet, Craig Cmehil wrote back that Germany was playing. Turns out this was generated by someone's Twitter API code. I didn't know the monkeys were listening to me, nor that they were capable of talking back. So now, I'm following the monkey(s). Every hour, something random will come my way. Better than having a fortune cookie delivery. And cheaper, too. I've known George Yu of SAP for many years, starting when he was assigned as the point of contact for our Americas' SAP Users Group (ASUG) liaison, helping to find speakers and other resources, speaking at conferences, and being an email contact. I'll sheepishly admit I spaced out his name and face one time when meeting him at an ASUG conference as he worked a booth for SAP. He has always been good-natured, quick to help, and a deep fount of knowledge on installation, ramp-up and other SAP product challenges. I spotted his name this morning as I started closing down a home workstation before traveling. Again, it was a bit out of context, and although there may be a few George Yu's in the world, his SDN bio says he's been with SAP since 1998, so I know this is my friend George. His blog "My First Two Days at Wen Chuan Earthquake, China" is a chilling first hand account of living through a life-threatening experience, the after-shocks, and the struggles for survival. If you might have heard about this disaster on the news, on the internet or other media, Ge0rge gives a very different perspective. George also presents an inside view of news availability within China. Since he witnessed the horror first hand, he was expecting information to be given about routes to safety, food and water locations, and other emergency broadcast help. However, censorship and denial of responsibility led to a news blackout. I'm sure everyone appreciates the risk George is taking in describing the official reactions. May 31st, the Bengies Drive-in had 3 of the top 5 movies in the country. Even though I'd seen Indiana Jones, as well as Iron Man, I went back for a second look, and a first look at Speed Racer. I made it through a little after 3:30, probably the second reel of Iron Man (after he drops through his garage roof and gets extinguished). I put out Tweets, but hashtags.org/tag/bengies isn't seeing them, so here are my inline movie, cartoon, and trailer commentaries. whats opera doc - 1957! one thing you don't see at indoor theaters is helicopter searchlights. show starts at #bengies with Speed Racer. Now. sunset at the #bengies and the place is packed. dragonfly just flew over, good omen I think. sitting in comfy adirondack chair near #bengies snack bar. some people don't like to follow rules. I sympathize, but am with mgmt on this 1.
reading Colin Fletcher's "River", waiting for twilight time at the #bengies - sun behind the screen. row 5 at the #bengies - skies clearing. great drivein night: remembered the DEET.